Transform your house, condominium or apartment into a garden oasis with fence and balcony railing planters. 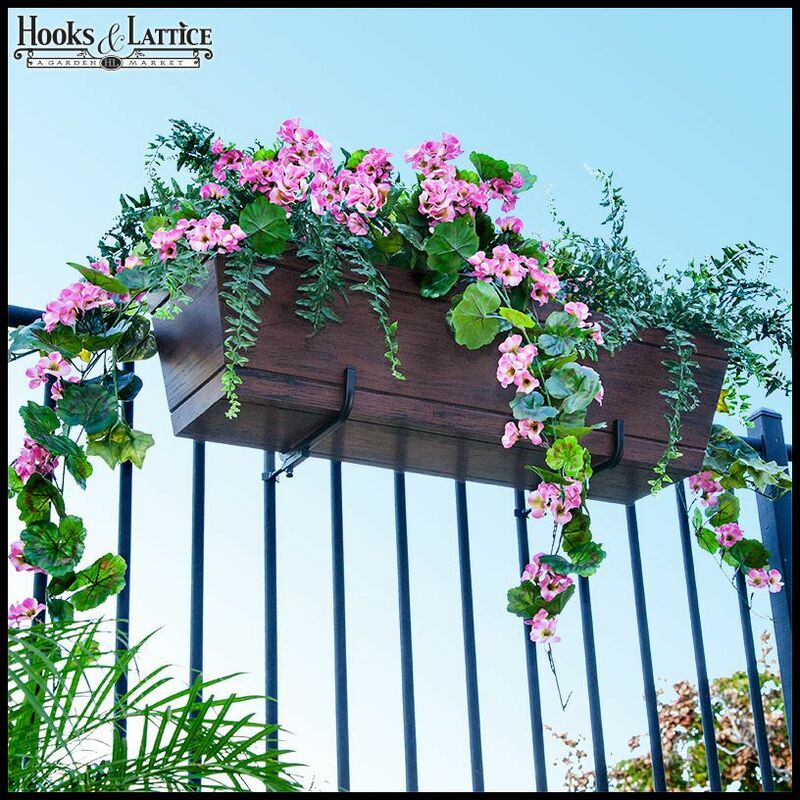 Almost any area bordered by a railing can be taken from bland to dramatic with rail planters handmade from wrought iron, aluminum, copper, fiberglass and coir-lined hayrack troughs. Any of our window boxes can be used as fence flower boxes or over-the-rail planters; simply add brackets. We also offer no-drill brackets. Made to fit nearly any size or shaped rail, planters are available in cedar and PVC composite. Add hanging fence accents or balcony decor to dress up dreary spaces and increase curb appeal. Hooks and Lattice offers extremely high-quality and long-lasting decorative investments. Be sure to check out helpful garden accessories like self-watering reservoirs and colorful liners for the best yard on the block! In addition to offering many material choices, you can confidently shop the largest selection of attractive container garden styles from the comfort of your home. You are sure to find something that adds curb appeal and allure. Creating dreamy decks and patios is effortless with our vast selections of garden materials, tools and accessories. Depending on the architectural style of your home, you may prefer one design to another. Our best advice is to choose a style that speaks to you. Flower boxes in any design will aesthetically improve exteriors and complement existing decor. Curb appeal also increases home values and helps you sell your home faster - especially when paired with other accents like shutters, faux balconies and iron accents. Pair any window box with one of our bracket collections suited to your space and installation type. We offer bracket solutions for every shape and size. Shop our collection of Railing Planter Brackets online or call for assistance. A unique option for people who prefer the look of rail top gardens, our over-the-railing planters in PVC composite and sustainable, natural cedar wood are an easy addition to front porches and wrap-around decks. These containers are also popular with HOAs and property management companies. Consider designs like Hampton, Standard Cedar, Lattice and Half-Barrel. A favorite small-space gardening solution, flower pot holders are a fast and simple way to enhance outdoor seating areas and dining spaces. From basic to ornate, our handcrafted hanging flower pot holders are made to mount to wooden fences, square posts, walls and more. Any flat, vertical surface can be made to look like a Spanish courtyard garden! Consider designs like our Venetian and Del Mar styles, designed to match our Decora series. We also have a standard 8" flower pot holder that mounts to 2x4 or 2x6 railings - no drilling required! We are proud to offer stellar customer service to all of our clients, regardless of project size. Whether you're shopping for your very first container garden, dressing up your balcony or fully renovating your home or business, our skilled team is here to help you find just what you need.